Description: This vigorous perennial (1-4 ft.) will spread by seed and rhizome to fill an area with late season splendor. It has long wands of brilliant gold flowers (late summer, fall). 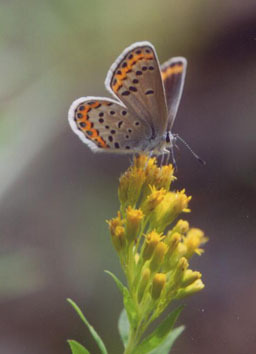 An attractive meadow plant butterflies will flock to, it is pictured here in a photo by Larry Everson, hosting a female Plebejus (Melissa blue). Sun, moderate water.